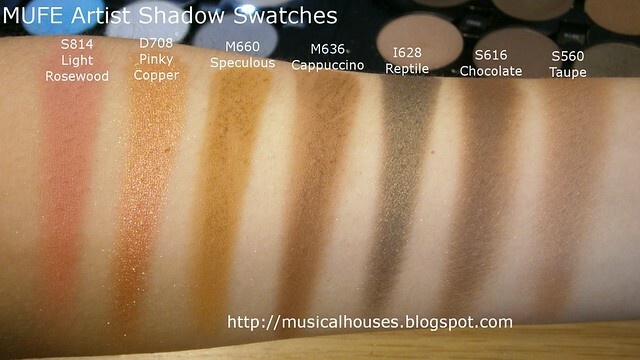 MUFE's (Make Up For Ever) Artist Shadow range of eyeshadows is certainly impressive, as my previous swatches have shown. 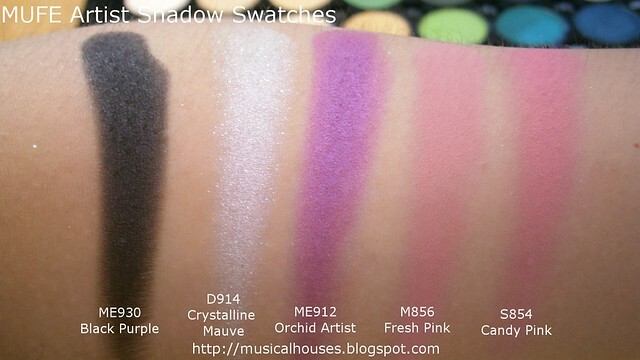 This time, I'm back with part 2 of the MUFE Artist Shadow swatches! 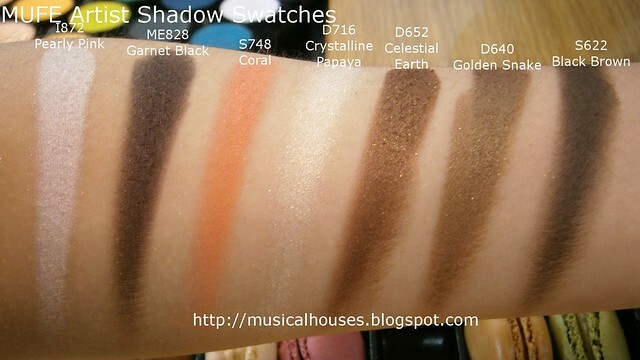 And again, these shadows are smooth, very nicely pigmented, and have a wide, wide variety of colours. If you're an eyeshadow junkie, you can definitely go crazy over the shadows, and if you're not - then there are still at least a few shades that will catch your eye! 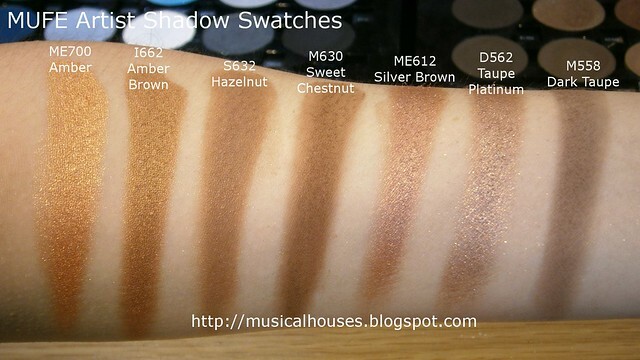 I mentioned that there are 5 finishes in the Artist Shadow range (Matte, Satin, Metallic, Iridescent, and Diamond), and you can tell which shade is which as it is denoted by the letter in the eyeshadow name - mattes start with M, satins start with S, metallics, start with ME, iridescents start with I, and diamonds start with D.
Because this bunch of swatches consists mostly of browns and pinksk (along with some reds and oranges), you'll notice that there are a ton of neutral shades. Almost every kind of brown (light, dark, cool, warm, shimmery, matte) is in there, which will certainly please neutral lovers, and there are a few choice taupe shades too! The pink and coral shades are also great as blushes - certainly a number of those look more blush-like than eyeshadow-like to me. But enough with my rambling. 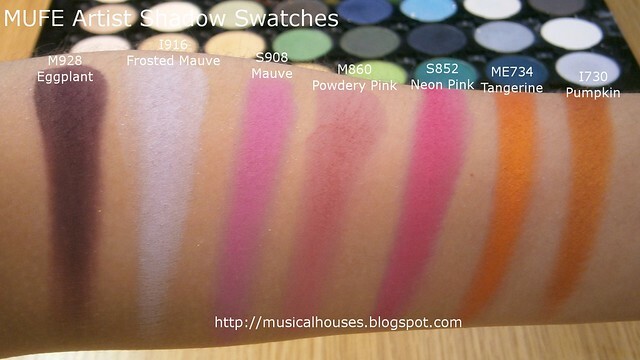 Without further ado, let's move on to the swatches! ME700 Amber is a warm gold amber shade. I662 Amber Brown is kinda like M700 Amber, only deeper and more brown. They're different finishes, but the finish looks identical to me when swatched. S632 Hazelnut is a medium neutral light brown shade that's almost matte. M630 Sweet Chestnut is a deeper brown than S632 Hazelnut, but there are similarities. M630 Sweet Chestnut is also completely matte. ME612 Silver Brown is a nice brown taupe! Yes this is another gorgeous taupe in the range, and a nice one for warm-toned girls. I actually think this could potentially be a contour shade for some warmer-toned girls. D562 Taupe Platinum is also a nice brown taupe, but with a more silvery finish. It's also another really pretty taupe. M558 Dark Taupe is a cool grey-brown taupe shade. Perfect if you've been looking for a matte taupe, or for a cool-toned crease shade. S814 Rosewood is a pinky shade with a hint of brown. It's a nice muted warm pink, and would also make a very pretty blush colour. D708 Pinky Copper looks quite similar to ME700 Amber to me, but maybe with a tinge more pink. SM660 Speculous is an warm orange-brown shade - just like its name. M636 Cappucino is a neutral medium brown that's a nice basic shade usable by everyone. Again, because this is a neutral brown that isn't too orange or grey and can blend nicely into skin colour, it's also another shade that could work as a contour. I628 Reptile is a gorgeous slightly shimmery, slightly cool-toned brown that has a tinge of green in it. 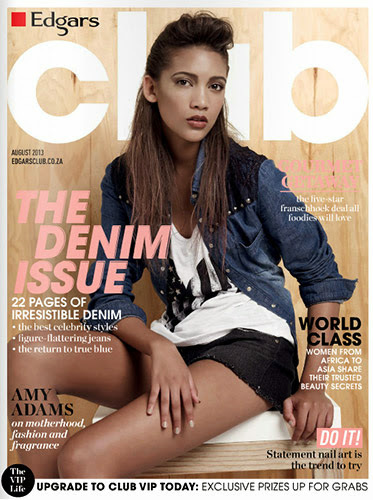 It's super gorgeous, and definitely one of those neutrals that aren't boring. S616 Chocolate is a nice basic cool-toned brown. Another everyone-can-use-it type shade. S560 Taupe is a light cool-toned brown taupe. Another very pretty shade - you guys know how I love my taupes! D826 Fig is a deep reddened-purple with lovely diamond sparkle. M806 Antique Pink is a light muted pink, that's actually quite wearable. S714 Bisque is a light pinky beige shade, just like its name. M656 Chestnut is a warm medium-deep brown that is very rich looking. S638 Mocha is a pale, yellowy brown that does indeed look like coffee with milk added. M626 Neutral Brown looks more like a deep, deep brown to me, but yes, if deep nearly-black shades are your thing, this is indeed a deepened neutral brown. M618 Espresso is another deep, blackened shade of brown, but this is darker and maybe more blackened than M626 Neutral Brown. I872 Pearly Pink is a light pastel pink that still packs a punch, pigmentation-wise. Definitely not one of those annoying sheer pastel shades! ME828 Garnet Black is a black shade with a tinge of red. I'm not sure if I should call it a reddened black or a blackned red, but you get the idea. S748 Coral is a medium coral shade, very nice and summery, and possibly a nice blush colour for girls who like their corals with a little bit of a pop. D716 Crystalline Papaya - I'm not too sure where the "Papaya" part of the name comes from, since papayas are like a bright orange shade to me, but this is a lovely warm beige that will get a lot of use as a lid or highlight colour. D652 Celestial Earth is another non-boring neutral - this is a rich, neutral brown with specks of gold glitter. Very pretty! D640 Golden Snake is another of my favourite browns in the range, right up there with I628 Reptile. It is quite similar to I628 Reptile, exxcept that D640 Golden Snake is lighter, and a smidge warmer. S622 Black Brown is - well, a blackened brown. It's more blackened than M626 Neutral Brown, and slightly more blackened than M618 Espresso as well. Obviously although MUFE is a brand often known for its bright, artistic colour palette, the neutrals here are aplenty to give neutral lovers like me plenty of choice! S900 Marshmallow is a whisper-sweet and girly pale pink. D868 Crystalline Pink is a light off-white pink shade. It's more pink and less beige than D716 Crystalline Papaya. S848 Raspberry is a cool-toned, slightly bright pink with a tinge of plum. This is a shade I could definitely see myself wearing as a blush, with a much lighter hand. I746 Watermelon is a warm watermelon pinky-coral shade. I can actually imagine this being a blush shade, too. M720 is a orange shade that does kinda remind me of apricots. M650 Cookie is a warm orange-brown that reminds me of those gingersnap cookies I love. D642 Sahara is a cool-toned light wheat brown. This is a basic neutral shade to be sure, but it's very pretty nonetheless. S924 Purple is a your basic purple shade that adds a pop of colour, but isn't exactly neon either. I902 Quartz is a light whitish pink. It's similar to D868 Crystalline Pink, but maybe less white, and it seems to be better pigmented too. I864 Baby Pink is a light baby pink. D850 Nitro Pink is like I864 Baby Pink, but deeper and brighter. S742 Tomato is a bright orange-red shade that does look like the colour of a ripened tomato. I722 Mandarin - another food-based shade that does look like the real-life version in terms of colour. This is a pretty unique shade of orange, it has a certain mutedness and isn't too bright, and it's not as red as other orange shades might be. M646 Latte - a light medium neutral brown. Another staple neutral brown that can serve as an everyday workhorse, or a contour shade too. M928 Eggplant is a deep eggplant purple that's not quite blackened - even on the skin it reads more purple than black. I916 Frosted Mauve is a very light off-white pink pastel shade. S908 Mauve is a sweet cool-toned, somewhat bright pink. It is mauve, but a brighter shade of mauve than what is normally used in makeup. It's quite pretty as a blush, too, if bright pink blushes are your thing. M860 Powdery Pink is a very nice muted medium pink. 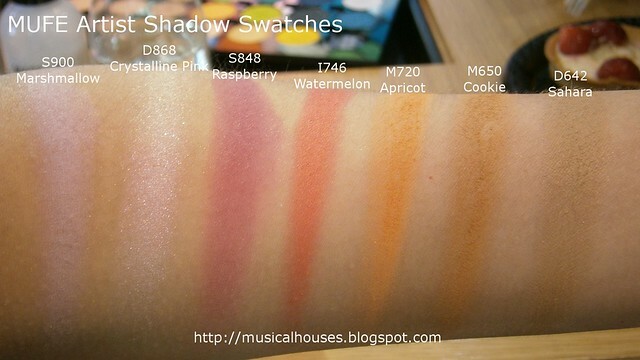 This is definitely another one of those shades I'd use as a blush - it would be so pretty on because it would blend into the skin nicely with a light hand. M852 Neon Pink is a matte neon pink. Not much to say, except that this is a great neon. ME734 Tangerine is kinda like a neon tangerine orange to me. Bright, and very cheery. I730 Pumpkin is a deeper shade of orange, but it's still bright. ME 930 Black Purple honestly looks like black to me when swatched. Perhaps it has a slight purple lean, it's hard to tell (it might be more apparent when swatched to a blackest-black shade, perhaps). D914 Crystalline Mauve - like the other "Crystalline"-named shades, this is an off-white pastel purple with a frosty sparkly finish. Quite pretty and girlhy. ME912 Orchid Artist is similar to S924 Purple, except that it's a bit brighter, and seems more orchid purple rather than violet purple. M856 Fresh Pink is just that - a neutral fresh pink. 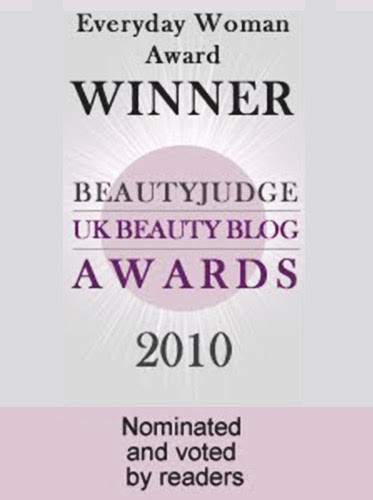 This is another great blush shade to me - I could probably wear this for an everyday shade! S854 Candy Pink is a medium cool[-toned pink that's somewhat reminiscent of D850 Nitro Pink, only that S854 Candy Pink is more cool-toned. 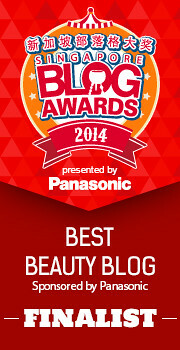 Again, this is a great blush shade for cooler-toned girls. 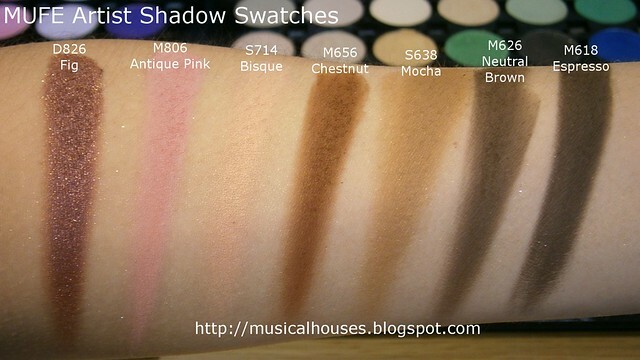 I a in love with all the neutral swatches, so many beautiful colours to choose from. I must head down to the counters for a good swatch and pick some up. 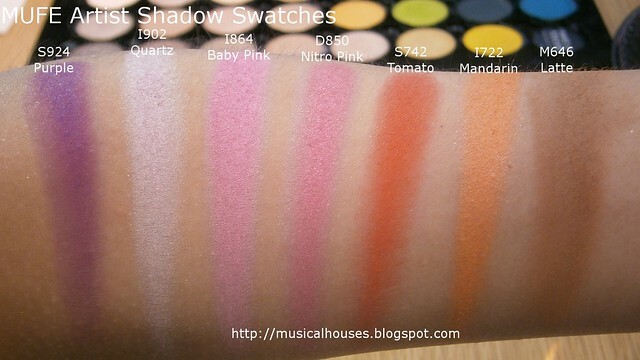 I absolutely love your swatches!! Love that you included their name and their number as well. Also found it so helpful that you gave your own description of each one. Any chance of a part 3 and part 4? You have the most helpful swatches! Thank you!! Thank you so much for your swatches! 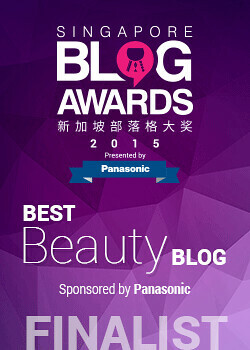 Your blog has been very helpful as I prepare for the sephora rouge VIB sale! Wow this post is so incredibly helpful! You are amazing girl thanks for all the hard work it will help me pick shades in the future even though I want all 210! Great post! This will be very helpful when I choose what to buy.